The discrepancy between material and spiritual is but the result of a difference of flow of time. The figure below displays different hourglasses that, for simplicity, we will not retain in most of the illustrations. Many of them show cross sections that are intentionally simplistic in order to capture the general principle. 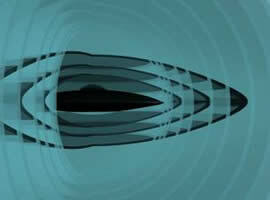 A ship is surrounded by different layers of temporal flows. Let us linger over the means of observation and perception, whether they are natural or technical. UFOs are silent as the sound wave emitted by the craft, bathed in conditions of high density of time, is progressively slowed, thus expanded in moving away from the emitter. It becomes an infrasound once it has left the temporal bubbles. This explains their "auditory" perception by the only animals endowed with specific organs. Then they manifest nervousness or fear, not understanding where this "noise" comes from. There is no boundary layer on which the shock wave could be born. In "visual" perception, the discrepancies are understandable as well. The temporal fields around the UFO respect Absolute Relativity: "the more time there is, the less space there is, and conversely." Thus, depending on the intensity and influence of these fields, the perception of a single object will vary between witnesses. A ship will be more or less luminous, more or less large, more or less material. Hence the divergent reports of witnesses. If the abductees (the "taken") are surprised at the enormous interior dimensions, it is no less readily explained: the size of UFOs is relative to the temporal referential. They are small outside the field, large within. The perception of distances, sizes, and shapes depends on the situation of every one of the witnesses and on the instantaneous temporal density of the UFO. The technical means of observation are of the same stripe. Photographs of UFOs are more or less blurred. 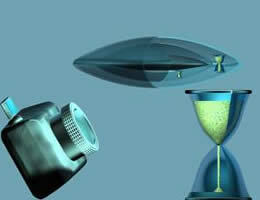 The temporal bubbles are equivalent to the capture of an object in rapid motion even if the UFO is stationary. As for speed, a space-time entity is a connection between space and time. Thus a photograph captures the immediate vibratory state of the foreground. High density of time is in tune with the psychological view of the witness, a view that an ET can influence. Many past appearances corresponded to the technical level of the epoch: chariots, airships, etc. These visions were produced by ETs with the consent of our subconscious, seat of the form-thoughts long emitted, multiplied, and consolidated by our beliefs, that is to say our "imagination" of the moment. In fact, imagination = creation of information = reality. Let us note in fact that there is nothing but creation in the universe. There is no reality without creation, as reality IS creation, whatever the origin may be. Try to demonstrate the converse! I wish you luck. This is precisely the whole problem of the perception that superimposes itself on our own psychological creativity, which is at the same time legitimate, natural, and universal, thus logical. Thus every perception is REAL but more or less shared! This is why Reality is Illusion and conversely. Again, slowly read the preceding once more, as a lot of debates could thus be calmed. The "real" forms of ET ships, in contemporary witnessings, coincide with the massive diffusion of photographic devices, which can not be influenced by a psychological signal, lacking access to the higher densities of time. ETs a priori no longer need adapt our perception, and more and more they present themselves as they are from their own point of view. Liberated from creative beliefs (a deformed description of the witnesses to the course of history), all thus is, for humanity, nothing but a problem of perceptual maturity, including the psychological and spiritual! Extraterrestrials do nothing but respect the laws of nature. 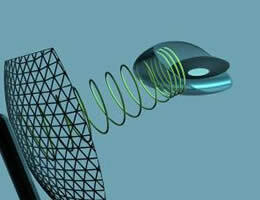 Radar emits waves that material bodies reflect. A detection module receives in return a weak portion of these waves, which it amplifies and translates in the form of a luminous plot. But then the train of emitted waves encounters a temporal field that causes variation in the frequency itself, and not the direction of the waves (the case of the stealth technology of our airplanes). If this modification is too great, the new frequency will be outside the radar spectrum. 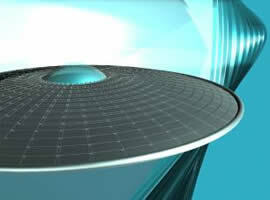 Material ships, although confirmed to be present by visual witnesses, are not always detected by a station: the radar frequencies are lower than the luminous frequencies. 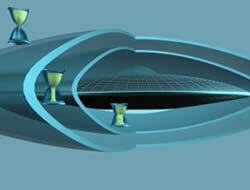 The waves (spires of time) of a radar are changed as they enter the temporal field of a ship. Their detection is erratic. Several secondary effects follow from the laws mastered by the ETs. Truncated beams of light are among them. Their length is included in the temporal field of the ship. Beyond the bubble, as with sound waves, the light disappears, descending into the infrared. The bubble around a ship is the natural limit of a luminous beam emitted in a specific density of time. Beyond, the frequency "reddens." 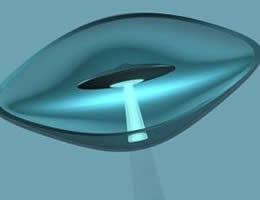 UFOs can conceal themselves in the clouds that they themselves form. 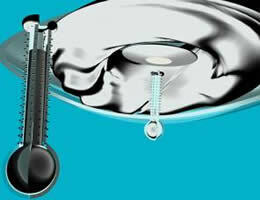 The temporal field creates a zone of cold by application of a Bose-Einstein condensate. Then condensation of the water vapor (a very different principle) is produced around the nave, as when you remove a bottle of fresh water from a refrigerator. Mist, fog, or even a dense cloud may appear, depending on the external conditions. The cold reigning around a ship engenders a condensation of the water vapor invisible until then and conceals it in an cloud depending on the atmospheric conditions.